Use Bedtime Bulb before bed to promote quality sleep. Great sleep: As simple as changing a light bulb. Too much blue and green light before bed disturb quality sleep. Use Bedtime Bulb in the evening in place of incandescent, halogen, and LED lighting. Imagine waking up well-rested. Every day. It’s possible with healthy evening habits. 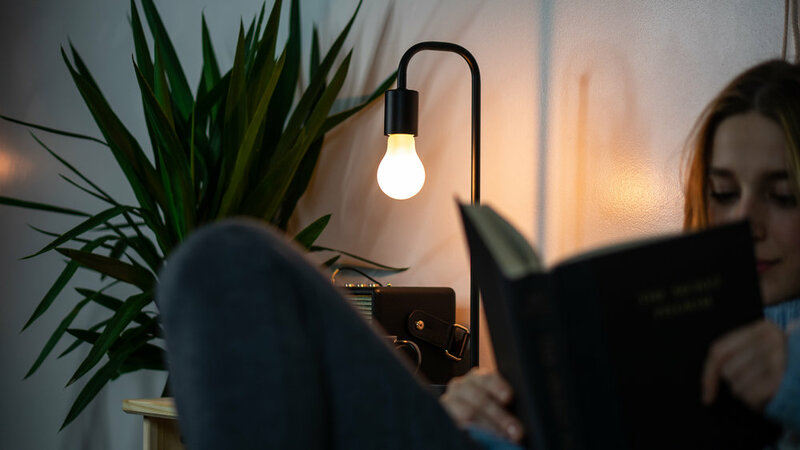 Bedtime Bulb provides comfortable, high-quality light for evening activities. It promotes relaxation and quality sleep without the need for total darkness. Thousands of users ❤️ Bedtime Bulb. Since replacing my bedside lights with Bedtime Bulb, I haven’t had to take any sleep medications. I feel so relaxed while reading in bed. Bedtime Bulb is a fantastic tool to help parents reclaim smooth sleep for their little ones…and themselves! I use this bulb with my favorite lamp every night and I really really love it. If you use the add-in "f.lux" on your laptop, this is for you.